"Star Trek: Discovery" will be back for a second season next year, CBS All Access announced today (Oct. 23). The series, which airs on a paid online streaming channel, is six episodes into its 13-episode first season. 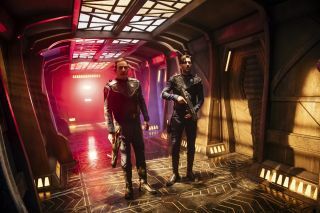 "In just six episodes, 'Star Trek: Discovery' has driven subscriber growth, critical acclaim and huge global fan interest for the first premium version of this great franchise," Marc DeBevoise, the president and chief operating officer of CBS interactive, told StarTrek.com in a statement. "This series has a remarkable creative team and cast who have demonstrated their ability to carry on the 'Star Trek' legacy." "We are extremely proud of what they've accomplished and are thrilled to be bringing fans a second season of this tremendous series," DeBevoise added. "Star Trek: Discovery" follows the adventures of Michael Burnham, Starfleet's first mutineer, and her work aboard the pioneering ship Discovery during war with Klingons. It airs Sunday nights on CBS All Access in the U.S. and Space Channel in Canada, as well as on Mondays on Netflix for the rest of the world. Space.com recaps each episode Monday morning.